eG Innovations’ third quarter was highlighted by a record number of new customer wins for management of virtual desktops and applications, product innovation and new strategic partnerships. A report by 451 Research said that eG Innovations is gaining momentum in the application performance management space by building on its steady growth with large enterprise customers. 451 Research noted that eG Enterprise is being used by hundreds of enterprise customers today to provide unprecedented performance visibility, automated cross-silo performance correlation and diagnosis, pre-emptive problem alerting and predictive analytics. These unique capabilities enable companies to accelerate performance diagnosis, reduce operational cost, deliver user satisfaction and unlock the potential of virtual, cloud and physical IT environments. 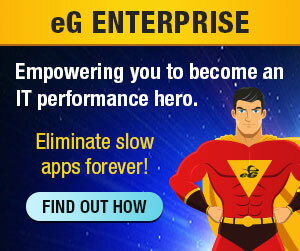 Accelerating Customer Growth: Today over 400 enterprise customers use eG Innovations’ eG Enterprise to manage their dynamic enterprise IT infrastructures, including VDI, application virtualization, and Citrix XenApp / XenDesktop technologies, besides other conventional IT applications like SAP, Java apps, databases, etc. Strong Product Innovation: eG Enterprise 5.6 builds on automated correlation and problem diagnosis technology to accelerate performance diagnosis, reduce operational cost, deliver user satisfaction and unlock the true potential of virtual, cloud and physical IT environments. The company was awarded two patents recently. The first one relates to its virtualization-aware automatic root-cause diagnosis technology that correlates application and virtualization performance. A second patent focuses on eG Innovations’ In-N-Out monitoring technology for virtual infrastructures that provides correlated outside and inside view of virtual machines. Strategic Partnerships: eG Innovations and Egenera announced a joint solution that offers customers greater return-on-investment by automating provisioning, performance management and capacity planning. With the joint solution, customers benefit from faster problem identification and resolution, thereby freeing up IT operations time for more strategic initiatives. eG Innovations announced a partnership with Red Hat whereby administrators can use eG Enterprise to monitor the Red Hat Enterprise Virtualization server and desktop platforms — including the Red Hat Enterprise Virtualization hypervisor, datastores, virtual networks and Virtual Machines. Additionally, eG Innovations’ software has been validated by Microsoft to work with Microsoft System Center Operations Manager (SCOM).